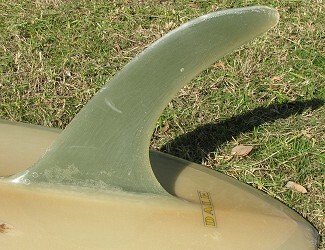 Stringerless foam blank, Volan glassed with 1 1/2 inch rail lap..
12'' x 9 1/2'' base x 13 1/2'' span @ 8 1/2''. Deck: DALE , orange and black text at front. Bottom: DALE , orange and black text behind fin. Purchased from Ulladulla, July 2007. Advertisement: Dale Surfboards, McTavish's Forms, circa 1968. Volume 1 Number 10 page 36.